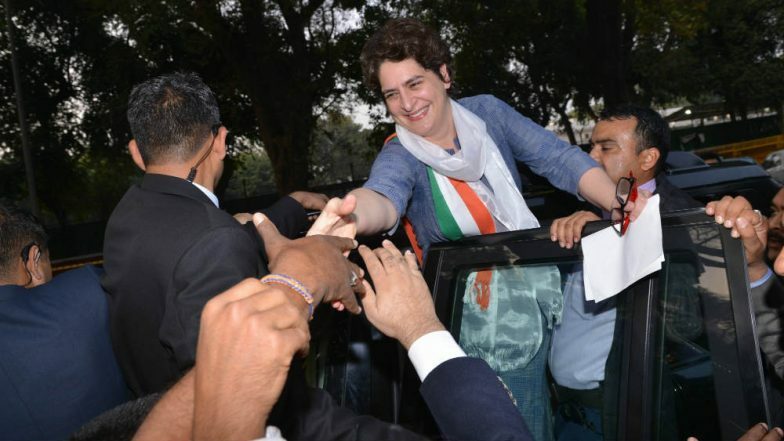 Lucknow, March 18: Hours after Bahujan Samaj Party supremo Mayawati lambasted Congress for creating confusion on the possibility of an alliance in Uttar Pradesh, Priyanka Gandhi made it clear that Congress is contesting the Lok Sabha Elections 2019 by their own. Adding more, Gandhi even stated that Congress doesn't want to disturb anyone and have no issues with anyone, but have an aim to defeat BJP. Speaking to the media on Monday, in between her ‘Ganga-Yatra’ in Uttar Pradesh, “We're fighting the elections alone, we have no issues with anyone, don't want to disturb anyone, our goal is to defeat BJP, their goal also is to defeat BJP.” Priyanka Gandhi Kickstarts Uttar Pradesh Campaign With Attack on PM Narendra Modi, Says 'Chowkidars Are For Rich, Not Farmers'. Mayawati had also said, “The BSP would like to make it clear once again that there is no alliance or understanding with the Congress in Uttar Pradesh and anywhere in the country. Our party workers should not succumb to confusion being spread almost every day by the Congress.” Uttar Pradesh Lok Sabha Elections 2019 Schedule: Constituency Wise Dates Of Voting And Results For UP General Elections. Earlier, Congress while releasing their candidates’ list had stated that they had left Mainpuri, Kannauj and Firozabad for SP, BSP and RLD in Uttar Pradesh. Also, it had announced that no candidates would be fielded from two seats where Apna Dal will contest.